ACCESS Cardholders (those Pennsylvania residents who monitor their government issued cash, food, or medical benefits with an EBT card), are invited to visit participating museums, science centers, gardens, historic sites and attractions at the deeply discounted rate of $2. Visiting cardholders must present their valid ACCESS Card and their matching photo ID to receive the discount. One ACCESS Card admits up to four family members at a rate of $2 per person – including the ACCESS Cardholder. Admission is to be paid by the visitor, not through their EBT card. At the Academy of Natural Sciences of Drexel University, get face-to-face with towering dinosaurs, meet live animals, and wander through a tropical garden filled with live butterflies. Founded in 1976, AAMP is the first institution funded and built by a major municipality to preserve, interpret and exhibit the heritage of African Americans. Founded in 1926, the American Swedish Historical Museum has been dedicated to preserving and promoting Swedish and Swedish-American cultural heritage and traditions for more than 80 years. Explore the world’s greatest collection of post-impressionist and early modern art with masterpieces by Renoir, Cézanne, Matisse, Picasso, Van Gogh, plus African sculpture, and more. With classes, tours, live musical performances, and family programs, there’s something for art lovers of all ages. The well-known and loved story of Betsy Ross sewing the first Stars & Stripes is tightly woven into the colorful fabric of America’s rich history. The Betsy Ross House, the birthplace of the American flag, is alive with the sights and sounds of the 18th century. Tour the house and then stay a while longer to learn more about Betsy and her exciting life and times through our interactive, historical programming. Chanticleer Garden is open April through October Wednesday through Sunday from 10 AM – 5 PM. Within 30 minutes of Philadelphia, Chanticleer is one of the great gardens of the region. Chanticleer has been called the most romantic, imaginative, and exciting public garden in America. The garden is a study of textures and forms, where foliage trumps flowers, the gardeners lead the design, and even the drinking fountains are sculptural. It is a garden of pleasure and learning, relaxing yet filled with ideas to take home. Experience live science happening all around you! Walk through the iconic, two-story tall Giant Heart, have a ball in our NEW sport science exhibit, SportsZone*, and climb through a web of firing neurons in Your Brain. Travel to faraway galaxies in the Fels Planetarium, see explosive, live science shows, and more—be sure to visit The Brain Bar where you can touch a real (plastinated) human brain. Fun for all ages. Center City’s only carousel features a zebra, a lion, an eagle, a dragon, and more! Hop on this spectacular All-American style carousel featuring hometown racehorse heroes Afleet Alex and Smarty Jones. *Please check venue’s website for current hours of operations. Putt your way through Center City’s ONLY 18-hole miniature golf course, featuring the iconic symbols of Philadelphia featuring Elfreth’s Alley, the Ben Franklin Bridge, Chinese Friendship Gate, Boathouse Row, The Liberty Bell and more. *Please check venue’s website for current hours of operations. Located in historic Germantown, Grumblethorpe is an 18th-century farmstead that was once the summer home of the Wister family. In the early 1800s, an observatory and clock were built in the residence. It also features a farmhouse, two-acre garden, greenhouse, and chicken coop. Grumblethorpe offers many educational programs to local schools and students. Known as “The Nation’s Church” because of the famous Revolution-era leaders who worshiped and were buried here, including Ben Franklin and Betsy Ross. Note About Parking: Independence Seaport Museum does not own a parking facility. Individual cars may park in the Hyatt Hotel Parking garage lot and have your parking ticket stamped at our Visitor Services for a reduced rate, to be paid upon exiting the garage. We also recommend street parking along Chestnut Street or Front Street. The Independence Seaport Museum is the region’s primary repository of art, artifacts and archival materials from the Greater Delaware Valley, Port of Philadelphia & other urban ports of the Delaware River. The James A. Michener Art Museum collects, preserves, interprets and exhibits American Art, with a focus on art of the Bucks County region. The Museum presents changing exhibitions that explore a variety of artistic expressions, and offers a diverse program of educational activities that seek to develop a lifelong involvement in the arts as well as nurture a wide range of audiences. The Liberty 360 3D Show in the PECO Theater takes visitors on a patriotic adventure led by Benjamin Franklin in 3D. From the bald eagle to the Statue of Liberty, discover the stories behind some of America’s most beloved symbols of freedom. The 15-minute film surrounds the audience in the customized wraparound PECO Theater. *Please check venue’s website for current hours of operations. Spend time with family and friends exploring Morris Arboretum’s 92-acre lush and colorful gardens. Discover your favorite garden spaces and learn from 12,000 labeled plants, trees and flowers. All SEPTA Trolley Lines, and Bus routes 7, 9, 21, 31, 42, 44, 48, 62, 124 & 125. America’s finest museum of medical history, the Mütter Museum displays its collections of anatomical specimens, models and medical instruments in a 19th century “cabinet museum” setting. Step inside the Museum of We the People and be inspired by rare artifacts, interactive exhibits, theatrical performances, timely conversations on current events, and more. Plus, don’t miss the iconic Signers’ Hall, featuring life-size bronze statues of the Founding Fathers. The National Liberty Museum is dedicated to preserving America’s heritage of freedom by encouraging people to find their own place in the story of liberty. Visitors to the Museum enjoy an inspiring and entertaining experience, as they interact with incredible stories of heroes and a collection of contemporary art. Family-friendly and cutting-edge, NMAJH brings to life the 360-year history of Jews in America, tracing the stories of immigrants becoming Americans. Enjoy hands-on, interactive displays, original films, historical documents, and fascinating artifacts — including Stephen Spielberg’s first camera, Hank Greenberg’s bat, and Irving Berlin’s piano. Explore ancient Egypt and the mummies, Asia, Africa, the Americas, Mesopotamia and the ancient Mediterranean world at this world-renowned museum. Enjoy gardens, shopping, and a café! 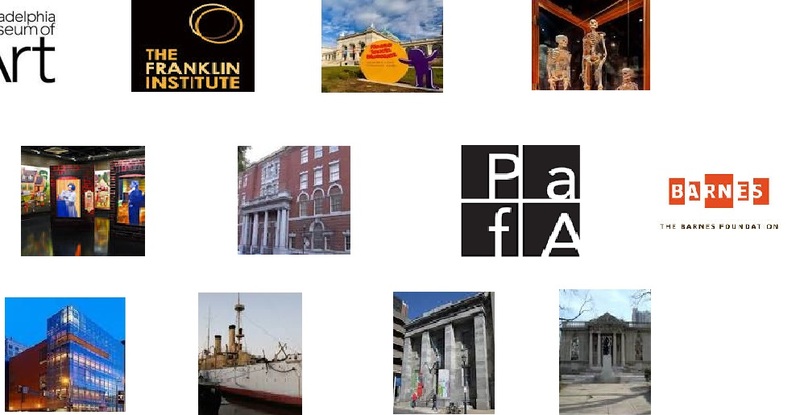 Located in the heart of Center City, PAFA is the nation’s oldest Museum and School of Fine Arts, boasting a vast collection of American art ranging from the 18th century to the present. The Philadelphia History Museum showcases an array of historical objects, art, and artifacts that tell the story of Philadelphia, from its founding in 1682 to the present day. The Philadelphia Museum of Art is one of the greatest museums in America. Offering fun and educational programs for all ages, the museum is an ideal place to spend time with friends and family looking at art. Philadelphia’s Magic Gardens is a mosaicked visionary art environment, gallery, and community arts center that provides access to Isaiah Zagar’s unique mosaic art. The Physick House, built in 1786, is the former home of Dr. Philip Syng Physick, the “Father of American Surgery” who cared for notable figures such as Dolly Madison and Andrew Jackson. The house is the only free-standing Federal townhouse remaining in Society Hill. It features a large garden and a medical museum on the second floor, along with beautifully decorated and furnished period rooms. The Please Touch Museum enriches the lives of children ages seven and younger by creating learning opportunities through play enabling us to lay the foundation for a lifetime of learning and cultural awareness. Powel House was the residence of the last mayor of Philadelphia under the Crown. This Georgian brick mansion was built in 1765 and has entertained notable guests from George Washington to Benjamin Franklin. Visitors today can stroll through the room where the Washingtons danced on their wedding anniversary and view the elegant colonial garden. Shofuso is a traditional-style Japanese house and nationally-ranked garden in West Fairmount Park that reflects the history of Japanese culture in Philadelphia, from the 1876 Centennial Exposition to the installation of its contemporary paintings in 2007. Shofuso is open for visitation and group tours from April to October. Held by the Wayne family as a private estate until 1980, Waynesborough is a sprawling property in Easttown Township that once was the residence of Revolutionary War hero “Mad” Anthony Wayne who served alongside George Washington. Waynesborough is now a home museum that features a Georgian-style house and even hosts historical reenactments from time to time. Woodmere is housed in a 19th-century stone Victorian mansion in Chestnut Hill. The building, grounds and the nucleus of the Permanent Collection are the benefactions of Charles Knox Smith who wished “to awaken the spirit of, the appreciation of, and the knowledge of art… in the City of Philadelphia and surrounding territory.” Today, the Permanent Collection consists of more than 3,000 works of art, celebrating the art and artists of Philadelphia. This is a city-wide initiative led by Art-Reach and supported by VOICES Education Center.